IPPL’s sanctuary residents has always included some Asian short-clawed otters. Shirley fell in love with this petite, playful species when living in Thailand, and she has taken in a number of retired animals over the years. 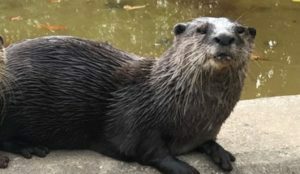 They are preferred for aquatic parks because they are small and relatively manageable, compared to other otter species. Currently IPPL has six resident otters. Otter couples have their own pond, hay-filled house, and fenced-in wooded yard. They eat different kinds of small fish, gizzards, and otter-cake, a special home-made recipe that includes eggs and fish-flavored cat food, which our red-shouldered hawk neighbors like to steal. They are adorable, lively little animals and keep our gibbons entertained as they watch the otters antics. Bubbins will do an impressive series of back-flips when swimming around her pond. Turnip was born at the Santa Barbara Zoological Gardens, a premier facility when it comes to the breeding of Asian Small-Clawed Otters. He and his family were transferred to the National Zoo in Washington, D.C. in April of 2012 where they continued to live in a large family unit. In the wild Asian otters live in multi-generational family units that range from 12 to 50 members! Unfortunately, there was some tension observed between the younger females and their mom, so a few of the otters were split up and came to IPPL in September of 2017. He is still paired with his sister, Pickles, while their other sister is now living with Satu. Turnip is a shy otter who isn’t too interested in interacting with the staff here at IPPL. He is extremely curious, however, and will always investigate any new items we place in his enclosure. He also likes to watch the animal care staff as they go about their day, almost as though he is supervising them to make sure they do a good job! Turnip is extremely intelligent and has been seen digging up the sod in his enclosure hunting for worms and other bugs, much to the displeasure of our maintenance staff who put the fresh sod down for him and Pickles right before they arrived. Pickles is originally from the Santa Barbara Zoological Gardens where she lived with her family for a short while. In April of 2012 the whole family of otters was transferred to the National Zoo in Washington, D.C. Unfortunately there was some tension observed between Pickles and the other females in her family, so she and Turnip, with whom she gets along great, were separated from the group and sent to IPPL in September of 2017. Olive, one of her sisters, was also sent here to be paired with our single male Satu. While talking with her old keepers at the National Zoo, the animal care staff was warned that Pickles has a very strong personality and boy were they right! She is a very stubborn otter that is not afraid to vocalize when she is displeased, especially when it comes to her meals being late. 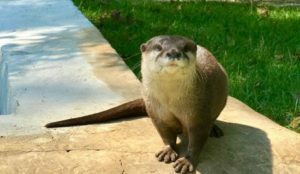 She has been nicknamed the “hangry” otter here at IPPL because if we are a few minutes late with one of her meals she will run over to the fence and “scream” at us until we feed her! 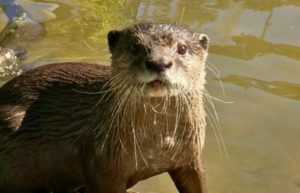 Luckily her love of food has proven beneficial in her participation in the training sessions we recently started with the otters and she is learning the desired behaviors very quickly. Olive was born at the Santa Barbara Zoological Gardens, a zoo that has had great success in the breeding and management of Asian Small-Clawed Otters. In April of 2012, Olive and her entire family were transferred to the National Zoo in Washington D.C. where they continued to live in a large family unit. Once they got settled in D.C. there was some tension observed between the younger females and their mom, so Olive and her siblings Pickles and Turnip came to IPPL in September of 2017. Once they arrived Olive was paired with Satu, a single male on the property who had lost his mate a few months earlier. At first Olive was too interested in her new surroundings to notice there was another otter in her enclosure, but as soon as she and Satu met each other they were inseparable, and are rarely seen more than a foot or two apart from each other. 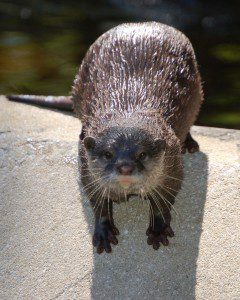 Olive is a very active otter who is extremely territorial of both Satu and her enclosure. Whenever the animal care staff goes in to change their igloo “house” it usually takes three people; two to switch out the igloo for a clean one and one to distract Olive! When we empty out the used igloo we find it packed full of sticks of all sizes which we can only assume is Olive’s way of decorating her home. Sometimes it’s so packed with debris we wonder how her and Satu fit in there to sleep at night. Satu, whose name means “one” in Malay, was born at the Singapore Zoological Gardens. 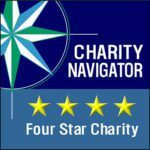 In February of 2006 he and his brother Dua were sent to the Monterey Bay Aquarium where the two quickly became famous for their antics and because Dua liked to “play” a small electric keyboard the keepers would give them as enrichment.  The pair was sent to IPPL in June 2009 when the aquarium decided to retire them. 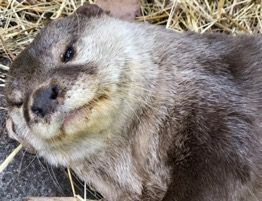 Satu was originally housed with Dua here but he escaped one day and the staff found him trying to get into the enclosure of a young female otter named Agape, so they let him in and the two immediately bonded. They were inseparable until Agapes death in 2016. Satu was then paired with another former zoo otter Daphne in March of 2017, but she unfortunately passed away two months later. His current mate, Olive, came to IPPL in September 2017 and this young female is definitely keeping Satu active! Even though Satu is quite old for an Asian otter, he is still extremely active and loves to search his enclosure for small rocks which he rolls around in his paws and carries with him from place to place. We often find his stashes of rocks when we go in to clean his enclosure. He also enjoys sunning himself in the grass, at least until rambunctious Olive jumps on him to get him to play!